Rick Riordan continues the adventures began in the Percy Jackson series. 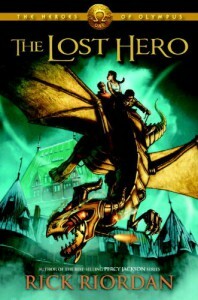 The Lost Hero introduces new characters as well as returning with ones from the former series. Percy Jackson is lost and Jason Grace is rescued and brought to Camp Half-Blood but he has lost his memories. He teams up with Piper McLean and Leo Valdez on a quest to save Olympus. You'll have to read the book to find out how things turn out for them and to find out what happened to Percy Jackson.